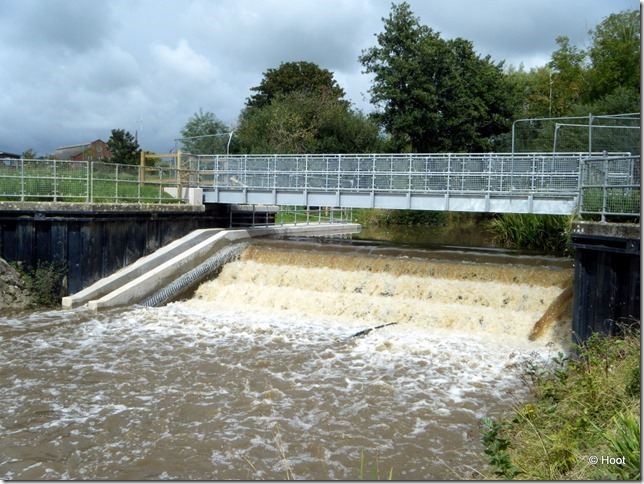 Autumn 2014 finally saw the completion of a fish pass at Gundry's Weir on the River Brit. This marks a significant milestone in the removal of barriers to fish migration on the Brit/Asker River system. It is the largest of the physical barriers and, more significantly, with its removal there are now over eight kilometres of river and suitable ditch networks upstream which provide an ideal habitat for spawning fish. The project began life back in 2009 when it became part of a strategic plan to deliver fish passes in the Brit/Asker, which involved not only the Environment Agency (EA), but the Frome, Piddle & West Dorset Fisheries Association (FP), West Country Rivers Trust (WRT) and Brit Friends of Rivers (FoR). 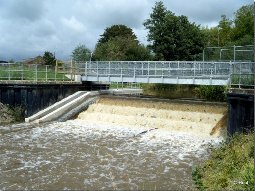 "Gundry's Weir is a significant asset within the Bridport Flood Alleviation Scheme and is maintained, operated and inspected by the EA’s Flood Risk Management team. Under the Water Framework Directive (WFD), there is a target to achieve Good Ecological Status for 70-80% of the catchment by 2015; fish migration is a significant factor in the measurement of this status. Despite its physical bulk preventing any fish migration, the Gundry project was one that just could not attract any funding. Locally we knew that there were inaccuracies in the WFD data about the ecological status of the River Brit. Whilst these were being investigated Roger Genge in my team, with support from Rosie Dilke in the Flood Risk Management team, were able to take the initial steps to get the project ready to go should funding become available. It was around this time (July 2012) that Geoff May (FoR) and Charles Dutton (FP) met with the EA Area Manager (Nick Gupta) and my boss, Jim Flory, to find out why such a significant obstacle to fish migration was not attracting the funding required to solve the problem. Support was also given by Dylan Bright (WRT). Locally we were also looking for the additional evidence that would send the project higher up the ranking order in the bidding process for funding. The Eel Regulations 2009 helped in this respect, and once there was EA Area Manager support following the meeting with Geoff and Charles, we finally obtained confirmation that the project would start. With funds in place the project was scheduled for construction in 2013/14 delivered by the EA’s Flood Risk Management team who have overall responsibility for the Gundry Weir site. " What sort of fish pass has been installed? 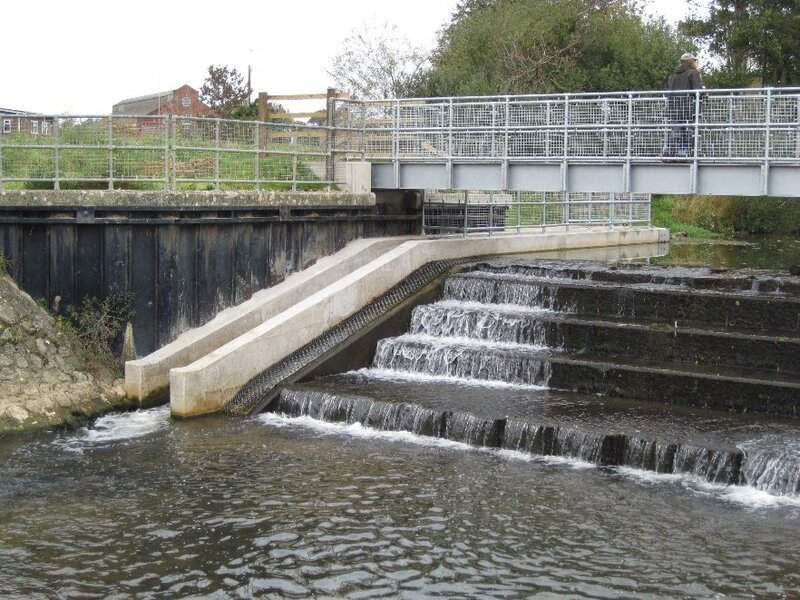 "A single flight Larinier fish pass has been installed within the weir against the right bank wall with a separate integral eel pass. The Larinier fish pass is a series of angled stainless steel plates set into a concrete ramp to disturb flows and allow the fish to climb it. The toe of the existing weir will tie into the entrance (downstream part) of the new pass. This is to ensure the attraction flow to the fish to ensure they can find the pass as they approach the weir. This will result in the Larinier pass extending approximately 10 metres upstream of the existing weir crest in order to ensure the required gradient of 15 degrees is achieved. The fish pass entrance close to the toe of the weir is a desirable feature which helps fish find the pass. The knock on effect was that excavations around the toe of the weir found cavities which needed to be addressed. 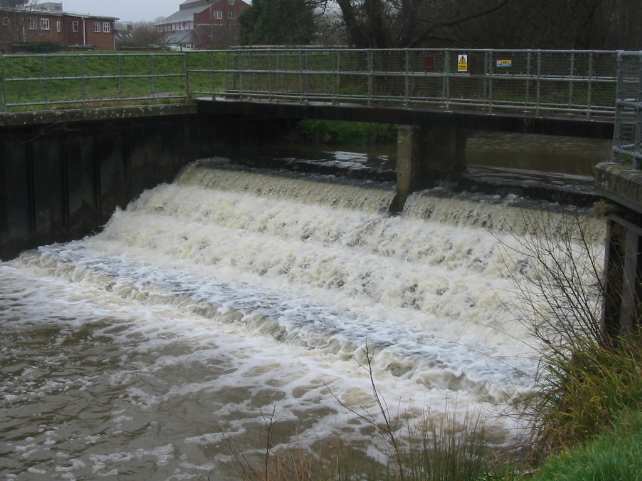 This protected the weir to extend its life expectancy as part of the flood alleviation scheme." "The project began very late into the 2013/14 season and was due to be completed before the onset of winter. A combination of unanticipated problems and poor weather conditions during the winter months delayed things and works were eventually completed in the autumn of 2014. " "From the beginning the option appraisal, flood risk assessment and other standard EA process procedures have to be undertaken. This proved a complex site which led to an additional number of problems..
•	The footbridge which crosses Gundry Weir, although a right of way managed by Dorset County Council, is actually part of the asset which is the responsibility of the EA. The footbridge was found to be in very poor condition and a replacement was included in the costs of the project. There were also land ownership queries that had to be addressed. •	A high voltage power cable ran along the length of the weir. Lengthy negotiations with Western Power were necessary to have this re-routed. •	There were also issues with the integrity of the wall against the fish pass was to be fixed, and this delayed the project together with some undermining of the weir which needed addressing before the project could continue. " "The project was managed by James Pemberton of the EA’s Capital Works team in Exeter (National Capital Programme Management Service – NCPMS). The contractor was Dawnus, an EA framework contractor, who are nationwide with offices in the South West. Dawnus have now completed a number of fish passage projects locally. 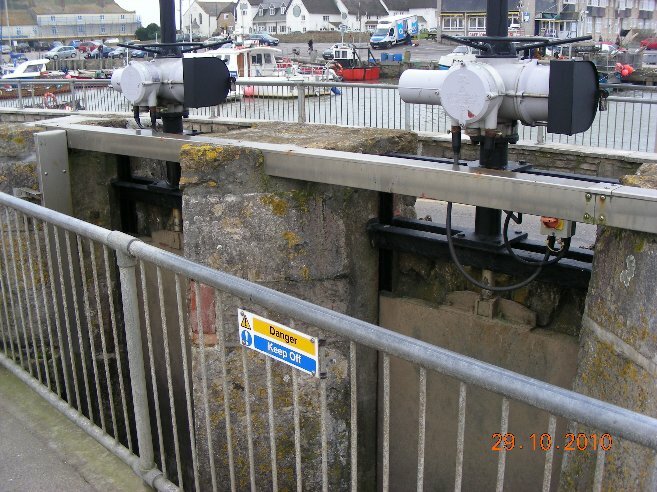 The fish pass and associated cameras for monitoring were supplied by Fishtek a company based in Devon and other works were completed by our own local EA workforce. Cameras are now in place to monitor fish passage at this location. This will be invaluable and coupled with our redd counting monitoring upstream of the pass we should start to build up a nice picture over the coming years. " "The monitoring is really important here as it is on all passes constructed, but one thing we are really proud of is delivering an environmental asset not only for those who have a passion for seeing fish migrate unfettered through the catchment but one for the community of Bridport itself. " "On the back of the fish pass project we have been working on Allington Pond which is just alongside the pass. This again will hopefully be another environmental asset for the community with excellent support from Bridport Town Council and all those who have been involved with the fish pass. We will not only have a super pond that will attract invertebrates, small mammals and birds but an area for the community to get involved with and enjoy as their own project. It really has been a combined effort with so many involved and just shows what can be achieved with all on a united front." Roger Genge, Environment Agency catchment officer (fisheries) said "Since the installation of the fish pass at Jessop's weir, the pass has been monitored to assess its suitability for large and small migratory fish. The pass is of a novel design so it is important to determine whether it works OK and whether a similar pass could be used at other locations. This assessment is carried out in a variety of ways from using cameras to monitor movement on the pass itself, redd counting (looking for where fish spawn) and population monitoring (counting the fish in a specified area). The most recent population survey, October 2011, identified a 400 mm sea trout upstream of the pass". Exciting news in that the evidence is growing that the pass is working for medium sized fish at least! 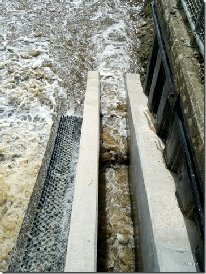 August 2011 saw the installation of a fish ladder at Palmer's Brewery. The project was completed on budget and some ten weeks ahead of schedule, a tribute to all involved. The origins of the project go back to around 2008 when our then chairman, the late John Hughes, first established contact with Richard Slocock and Charles Dutton of the Frome, Piddle & West Dorset Fisheries Association (FPWDFA) about tackling the barriers to fish migration on the Brit river system. Richard and Charles surveyed the rivers and barriers and reported back to John that the hatches and weir at the brewery might be the easiest to tackle first. John duly reported back to our committee. Some months later, and following John's death, there was a meeting on site in October 2009 with Cleeves Palmer (Palmers Brewery) and Roger Genge (Environment Agency) which was helpful in garnering support for the installation of a fish pass, and it was agreed in the interim to institute a managed regime for the opening of the hatches when the fish were migrating. 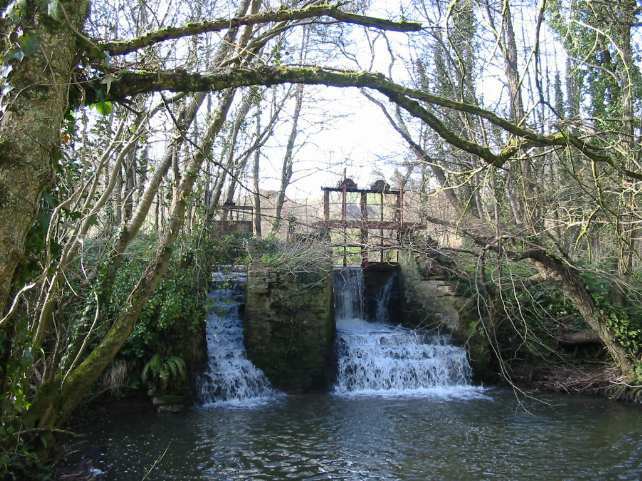 The project then suddenly took off early in 2010 when Charles Dutton secured funding through the Westcountry Rivers Trust for various in-river improvements, including a fish pass at the Brewery. "Once we got the initial fish pass design approved by the EA (Greig Armstrong Head of Fish Pass Design EA), I insisted that the F & P be the driver of the project....I wanted to put the work out to public tender and ultimately achieve a competitive price and better use of public money...we had three bids in ranging from £23,500 to £70,000+." "I became involved as project manager just as the tendering process was being completed. My brief was to ensure that the fish pass was installed no later than October 2011." "The fish pass is a Larinier Super with active baffle fish pass. The cost of fabrication and installation was subject to a tendering process which had three companies submit interest. 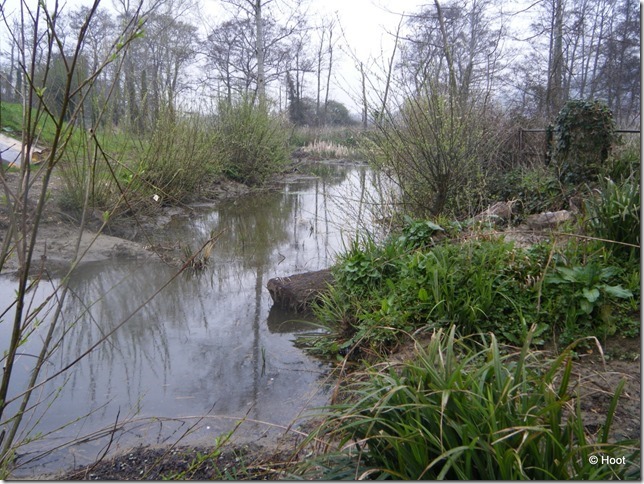 The budget management of this part of the project was undertaken by Westcountry Rivers Trust." How much was your budget for installation? "£23,500 funding was secured via the Association of Rivers Trusts (now called The Rivers Trust) and held with Westcountry Rivers Trust. The EA also forwarded some funding to be held by Westcountry Rivers Trust." "From the construction tendering process until installation took six months." Tell us about the major hurdles you had to overcome - Planning Permission, Flood Defence permission, window of opportunity etc. "I have project managed capital schemes over many years in the public sector so have experience of dealing with public sector 'red tape'. One thing that I have learned is to work with people to ensure that the project outcome is delivered within budget and on time. I had to obtain various planning permissions as a result of the site being predominantly of listed status. 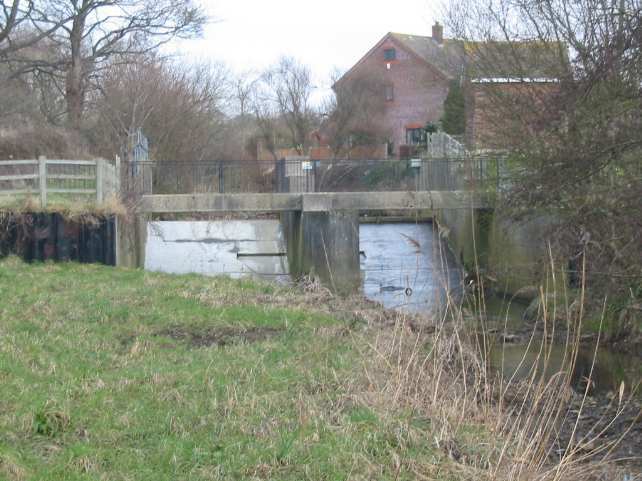 The planning process was changed from April 2011 and the installation of a fish pass was new to some staff within West Dorset District Council. With all projects, one comes up against some issues that need to be addressed and this project was no different. I am very pleased to report that I was helped and supported throughout the process by West Dorset District Council, the EA at Blandford, Tamar Consulting (commercial arm of Westcountry Rivers Trust) and Dorset Wildlife Trust as well as Fishway Engineering Ltd."
"The contractors were Fishway Engineering Ltd who have designed and installed many fish passes. I found them to be very helpful and cooperative to work with." "I think we got a little lucky with the weather when we were constructing the concrete ramp. We had several weeks of dry weather only for that to change four hours after the ramp was completed! We had over two inches of rain overnight. Installation went very smoothly and the construction team did a great job as the site access to lower the prefabricated fish pass was tight. The only issue, which remains outstanding at the moment, is the installation of the debris boom which could not be completed. This was as a result of the solid rock bed - a solution is being formulated." "Once the adjacent hatches were closed it took about an hour for water to rise sufficiently to pass down the fish pass; and this is in low flows. I have visited the site several times since, as have others, and we are all very pleased to see the extent to which the water flows down the fish pass. Longer term monitoring will be undertaken by the Frome Piddle & West Dorset Fisheries Association and Westcountry Rivers Trust to ensure that there is sufficient tail water to encourage the migratory fish to use the pass." And you delivered ahead of schedule and within budget...? "I am very pleased that we have been able to deliver the project 10 weeks ahead of the deadline (window of opportunity was October due to the migratory habits of the Salmon) and within the original budget." Fish have been recorded passing upstream over Jessops' Weir with an ultrasound device mounted on the bank. 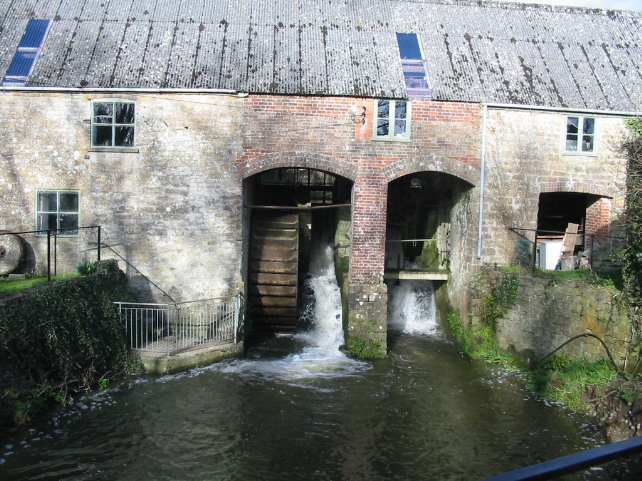 The video contains snapshots of fish passing up the "fish ladder" at Jessop's weir on the River Brit, Bridport, Dorset. Only exciting if you are into fish migration! The first set of sequences are video recorded on an underwater ultrasound device maufactured by Didson (USA) which produces the triangle of reflected sound. The Didson and camera are mounted just upstream from the weir, on the right-hand bank. Water is flowing from bottom of the screen to top. The light white/blue flecks going up the screen are leaves going downstream - the white haze at the narrow part of the triangle is sound reflection from the silt lying on the bottom of the river - hopefully you will recognise the fish (which are the little flecks of white) moving about from side to side. The sudden jumps of white (and shadows) etc are the fish coming up the pass. The three horizontal bars at the widest part of the view are the top of the weir crest and two of the baffles on the weir face. The dates to the side represent the day on which those particular shots were recorded. The burst speed of fish moving up the fish pass make it impossible to record all of the fish movement with the technology available - the camera records only 1 frame every five frames. About halfway through the video, a fishes eyeball fills the screen! About three quarters of the way through, the still frame shows a large fish coming over the top of the weir, estimated to be over a metre in length! Passage issues for migratory fish on the Brit/Asker systems have come on leaps and bounds in the last year or so. Four organisations consisting of Friends of Rivers (Brit and Asker), Environment Agency (EA), Frome, Piddle and West Dorset Fisheries Association (FP&WDFA) and the Westcountry Rivers Trust(WRT) have really come together to tackle the problems head-on. After identifying three major obstacles namely Palmer's Weir, Jessop's Weir and Gundry Weir, plans are being made as to best tackle each site as they have very different features. 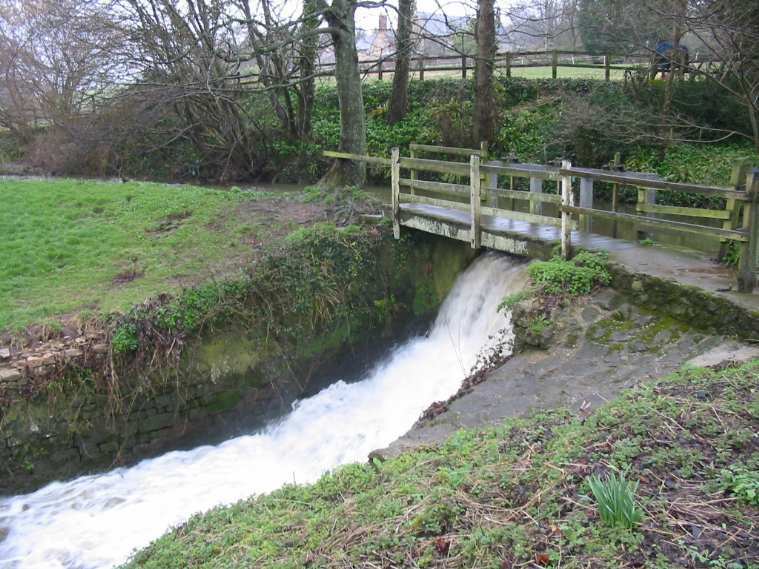 One project has already been completed, the weir at Jessop's (see below) which consists of two steep concrete slopes. Roger Genge of the EA secured funding and designed a series of baffles made of recycled materials which have been bolted to the face of the concrete slope. With staggered gaps this produces a zigzag pattern which fish can negotiate. 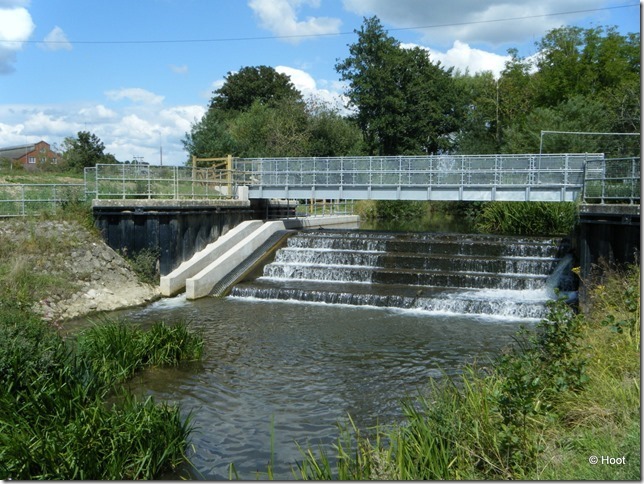 The project was completed in late March and also included an eel pass on the second slope. Although no fish have been seen to ascend the pass, the lack of fish in the pool below may indicate that they have simply passed through. With recent spates and fish seen at other obstacles it is very unusual not to see fish at this time; hopefully fish will be actually witnessed using the pass soon. The second major project in the pipeline is at Palmer's Weir where the Asker joins the Brit. Plans have already been drawn up and a Larinier type pass has been designed for this site. Palmer's Brewery is in full support of this project and the FP&WDFA, WRT, EA and Palmer's Brewery are working together to make this venture a success; once all the design and funding details have been sorted out the project should be going ahead next year in time for the 2011 Autumn run. Funding was made available to survey the weir at Gundry's and was carried out in September. Again a Larinier type pass is planned and is desperately needed as this is a major obstacle where salmon and sea trout are seen every year struggling to negotiate the steps. Recent electro fishing surveys revealed a few salmon parr below the weir but none further upstream. Hopefully funding can be made available and the last major obstacle for many miles removed. Finally it has been suggested that a small improvement at West Bay Harbour could be beneficial. Although fish can pass over the harbour hatches at high spring tides, with a relatively modest adaptation the fish could find passage easier and on more tides. Although no formal plans have been made yet, one suggestion was to make a v-notch in one of the hatches which would lower the height and concentrate the flow without affecting the levels behind. Other ideas may materialise and it would be very beneficial to improve the situation as fish are often waiting for many days in full view and are very vulnerable at this location. In the coming winter it is hoped that a few members of FoR are instructed on redd counting so that some idea of the impact of new fish passes can be observed and recorded in future years. 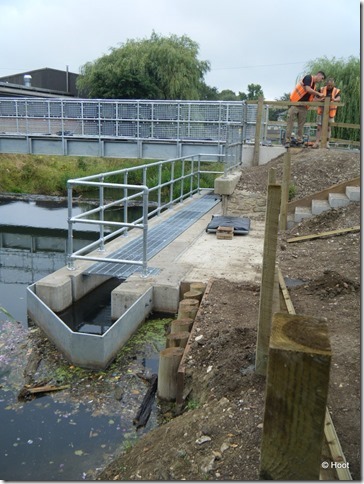 Fish Ladder installed at Jessops! 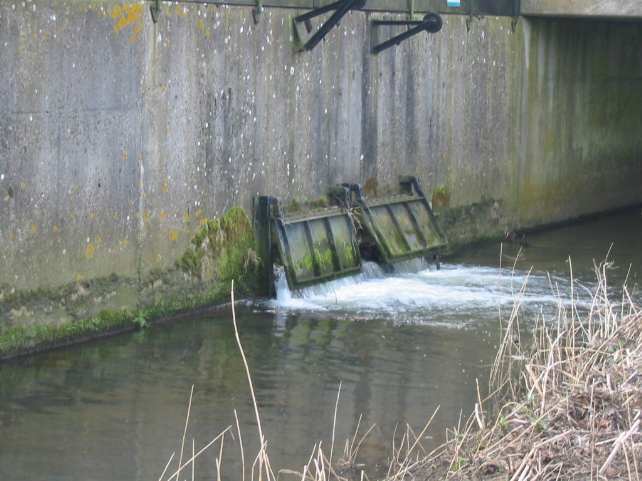 Thanks largely to the determined efforts of Roger Genge at the Environment Agency, a fish ladder has been successfully installed at Jessops (March 2010). This should assist migratory salmon and trout as well as local trout like the one pictured in the Migratory Fish section. The ladder comprises approximately 25 sections of battens made from recycled plastic and secured to the concrete with steel supports. The ladder is designed to provide small pools of relatively still water in which migrating fish can rest before making their next leap upstream. The picture shows the ladder before water is re-directed to the main channel. The ladder is a testament to the pioneering efforts of the late Captain John Hughes, who campaigned tirelessly for the removal of obstacles to the natural habitats of migratory fish. It is intended that a plaque in his memory will be installed at Jessops in the near future. At the same time as the fish ladder, an eel ladder was also installed. This was in the left channel, looking upstream. In August 2008, the Dorchester Fishing Club have successfully installed a Larinier fish pass at Loud's Mill on the river Frome. They have a comprehensive set of pictures on their website log (or blog) including amazing videos of fish detected by their optical fish counter. Follow this link and use the shift key to get a new window. Charles Dutton was instrumental in making all this happen. At the causeway at the head of West Bay Harbour, there are electrically-operated gates, maintained and operated by the West Dorset District Council. Fish can readily gain access to the river at some time on every tide and no remedial action is required. This is a major structure which provided the head for a water wheel at the brewery. It is important in fisheries' terms as it lies downstream of the Asker confluence, thus affecting runs of fish to the whole catchment area. The main weir is a stepped structure with a retained head of the order of 1.3 metres. It is a major obstruction at most flows, but is said to be passable at extremely high flows when the tailwater level is backed-up. There is a set of four hatches to the East side of the weir. They have a similar drop to the main weir, broken by a cill, and are likely to be impassable at low to medium flows when closed. This is clearly a major obstruction in a critical location, and some remedial action is required. The simplest and cheapest option would be operate with one or more sluces partially open to provide access to migrating fish. This would lower the retained level upstream but provide ready passage for fish. It might under certain flow conditions preclude operation of the water wheel at the brewery. This does not now operate brewery machinery. It does however provide a visual effect, pertaining to the historic industrial image of the brewery. As an alternative the wheel could of course be driven by an electric motor. On occasions it could have an impact on visual amenity, with upstream levels lowered and the weir dry for a time. Palmers kindly agreed to open their sluice gates during August and September to allow migrating sea-trout to make their way up river. Please keep an eye out for sea-trout possibly stranded at Jessops or Gundry weir. Hopefully, the sluice gates will be opened again in November-December when migrating salmon might be on the move. This is a formidable structure with a head drop of the order of 1.65 m over a series of steps. The structure is completely impassable at low to medium flows, though at high flows the tailwater level builds up to the extent that passage is feasible. The weir has clearly been rebuilt in recent years. 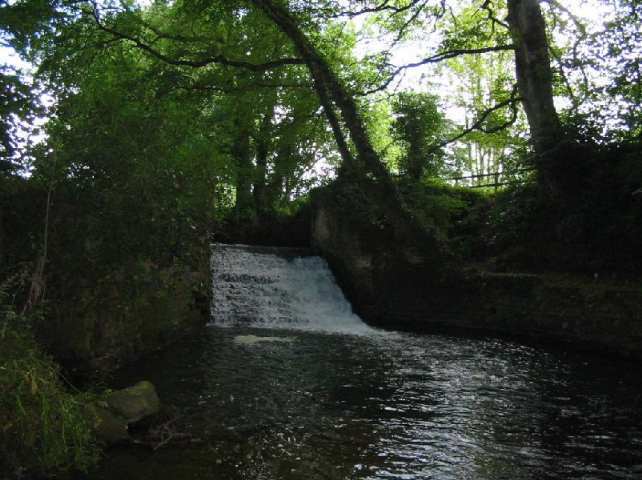 It is a matter of considerable regret that the opportunity was not taken to incorporate a fish pass (c.f. Pymore) as the cost would have been minimal compared to the retrofit that is now necessary. Removal or substantial lowering of the weir itself. Could be the most cost-effective and environmentally sound option but may have unacceptable side effects, such as permanent drying of the mill channel, and erosion of the banks upstream. However, this option should be evaluated before the others are considered. 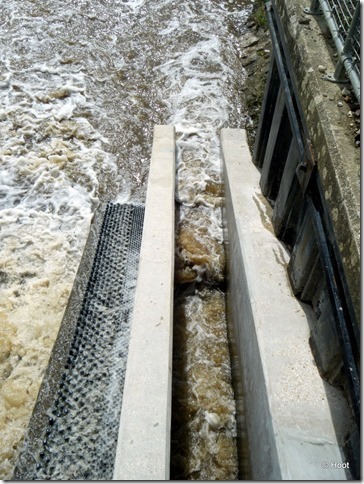 Provision of a fish pass at the weir. As a retrofit this is likely to cost of the order of £70-90K. Engineer the mill stream to allow fish passage. One possibility would be to effectively turn the channel into a fish pass. It would require construction of about five retaining walls (traverses) each with a head loss of the order of 0.4 metres. A thorough survey would be required to establish the feasibility of this option and to identify the optimal location for the walls. Another possibility is to install a prefabricated pass into the uppermost sluice where most of the head is lost. At low flows, the millstream could take most of the flow of the river, such that fish would be attracted into the lower end where it rejoins the main channel. At very high flows, fish are likely to continue up the main channel and hopefully gain access over the weir, as at present. At intermediate flows, fish might be attracted up the main channel but be unable to ascend the weir. This is a potential limitation of this approach. 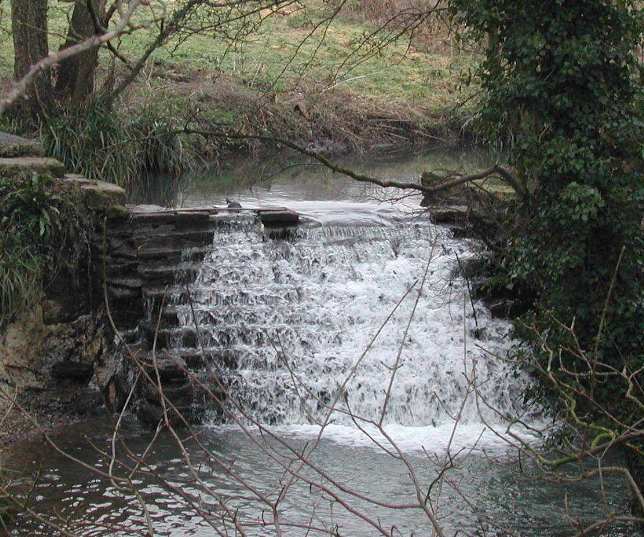 An old factory weir at this site represented an obstruction at the time of the 1992 survey, with a head drop of the order of 1 m. However, it is currently in the process of being rebuilt, and a fish pass has been incorporated but requires supervision to ensure debris is removed. Another formidable milldam with a normal operating head of the order of 3 metres. In November 2000, lifting the sluices leaving the mill leat dry lowered the upstream head; this was presumably a short-term action to reduce the flood risk. However, the head was still in excess of 2m and the weir was totally impassable; many brown trout were apparent, leaping at its base. As the mill leat still operates for much of the time, even if just for amenity purposes, it is likely that removal of this structure would be unacceptable to the owner. The only other option for remedial action would be a fish pass and this should be investigated. Such action would only, of course, be justified if the obstruction downstream at Slape Manor were to be remedied. River Asker flood relief scheme, Jessops, Bridport. Above: Weir on flood relief channel. Hatches where the old main channel leaves the flood relief channel, looking upstream. The head loss across this structure is minimal, and when it is sufficiently open passage upstream of the old main channel would be straightforward. Most of the head is lost in the old main channel over two small, privately-owned weirs with head of the order of 0.75m and 0.35 m representing only minor obstacles. Where the old main river channel rejoins the main river there are flow-controlled hatches with a head-loss of about 0.15m. This arrangement contrives to be virtually impassable to fish. The placing of such a structure in recent years (1970's?) on a migratory fish river is extraordinary and should be remedied as a matter of urgency. Ideally, fish passage should be possible in both channels, as the main flow varies between them according to the river height. The only remedy at the sloping weir on the flood relief channel would appear to be a fish pass by-passing the structure. Costs are likely to be of the order of £70-90K The remedy on the old main channel is hopefully simpler and cheaper. If one or both flaps at the lower end could instead be operated as level-controlled hatches, fish passage would be straightforward; no other modification of the structure would be required. On 1st October one year, sea-trout were seen trying to get up the left-hand side of Jessops' Wier. The Mangerton is a tributary of the Asker, and the mill is situated on the lower reaches. The water level situation here depends on whether or not the mill is being operated. If it is not, the sluices beside the wheel at the mill itself and at the head weir are lifted. At medium flows, such as were obtaining at the time of the inspection in November 2000, and at high flows, it is likely that the head weir is passable. The total head drop is in excess of a metre, but with sufficient flow over the small steps it should not present a major problem. The hatch at the mill is unlikely to be passable, but as the main flow will be down the main channel when most fish would wish to pass this point, few fish will arrive at the mill itself. When the mill is operating, the hatches at the mill and at the weir are dropped, and the retained head increases to the order of 2 metres. In this state, both structures will be impassable. It is not known how often, and for how long, the full head is retained for milling operation. When the mill is operating, the hatch beside the wheel is closed and the head water level is increased by about 1 metre. There are two weirs, one close to the mill down stream of the leat with a head drop in exess of 2m and the other at the beginning of the leat behind the Loders Arms with a drop of about 1m. Neither weirs are passable. Trout can be seen leaping up the weir in a futile attempt to pass up stream Some form of fish pass is necessary at the smaller weir to allow migrating trout to reach the breeding grounds.